1 of 4 Heat oven to 400 degrees . Coat a large rimmed baking pan with nonstick cooking spray. 2 of 4 Place tomatoes, mushrooms and scallions in prepared baking pan and toss with olive oil. Season with salt and pepper and bake at 400 degrees for 30 minutes. Remove from oven and toss with basil and oregano. 3 of 4 Place flatbread on a baking sheet. Spoon vegetable mixture over top; tear cheese into bite-size pieces and scatter over vegetables. 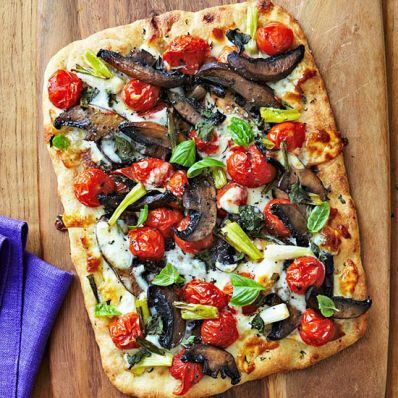 Bake at 400 degrees for 15 to 20 minutes or until flatbread is crispy. 4 of 4 Allow to cool slightly before slicing. Per Serving: 788 mg sodium, 4 g fiber, 3 g sat. fat, 11 mg chol., 12 g Fat, total, 44 g carb., 14 g pro., 339 kcal cal.